I am pretty certain that I am the only person that cried. In fact, I know I was the only person that cried because my seat was back and centre and I didn’t see another blubbering mess aboard the flight to Milford Sound that morning. I sat there, in awe of what was unfolding below and trying not to have a full-on meltdown, on a plane, in front of a group of strangers. When I arrived at the airport and found the Glenorchy Air desk I nervously talked at the staff until it was time to go. Flying has never been my favorite thing to do, commercial jet journeys normally consist of me sleeping until it’s over or holding Robbie’s hand so tight until again, he tells me it is all over. This would be my first ever time in a fixed-wing plane. I was nervous but I think the excitement was taking over. We met Mackenzie, the man in charge of the plane. He kindly reassured us the Glenorchy Air hadn’t had an accident for 25 years as he handed my ‘float coat’. We made our way out to the plane and we were in the air before I could even think about it. Having the back seat meant I could shoot from both windows and soak up all the mountain goodness. I was in awe. Everything as far as the eye could see was unbelievably beautiful. The mountains covered in snow, the blue of the lake and the fact that I was above it all was making all my senses do funny things. Pressed up against the window with my camera I was watching the world go by, through my lens. I kept having to remind myself to enjoy it through my own eyes and not my viewfinder. This was in between pinching myself and wiping away my tears. We flew over Glenorchy, hitched a left and straight on to Milford Sound. We flew over the Humboldt mountains, over Lake Wakatipu, alpine lakes, snow-covered amazingness and clouds making their way in and out of the gaps between the mountains. As we approached Milford Sound my heart started to beat a little faster. Rudyard Kipling once said that Milford Sound is the 8th wonder of the world, and mate, you’re right. Its one of those places that you need to visit, at least once in your life. I can’t quite explain how grand it is, the sheer size of the mountains is amplified when you put boats and planes next to them for size comparison. The pilot seemed to mooch right on past the runway, heading out toward the Tasman Sea. That’s right, not only did I get to see mountains from the air I also got to see the wild west coast. Quick U-Turn in the air and we head back down the sound, we were flying smack down the middle of the sound. The mountains either side of us and the worlds smallest runway in sight. I couldn’t believe that I was, not literally, but a touching distance from Mitre peak and about to land in one of my favourite places in the world. I stopped shooting and gripped the seat as we made a smooth landing at the airport. There was a bus waiting and we were en route to our boat for a two-hour cruise around the sound and back out toward the Tasman Sea. Top tip – if you’re getting on a boat that offers you a food option, dont queue up and wait, you will miss the departure from the dock and Mitre peak in all its glory. Go upstairs, sit on the deck and grab some food later. I did just that and enjoyed the whole top deck to myself for half and hour! It never gets old, no matter how many times you see it in real life or on social media, postcards and calendars. Mitre peak takes my breath away every single time. The cruise was beautiful, the sun was shining, the water was calm and most of the passengers on the boat were held up inside. As people started to appear I went to the front of the boat and hung around out of the side door. I saw something move out of the water in the distance, I ran to the front of the boat as the captain signalled something to me with his hands. I was too busy talking to our visitor. We had a beautiful dolphin following the boat. He was jumping out of the water and playing in the bow waves… after selfishly enjoying this all to myself I signalled back the universal hand sign for Dolphin and the captain announced it to the whole boat, I quickly made my way away from the front in fear of getting pushed overboard. When the Dolphin hype subsided I went back and watched our little friend lead us all the way back down the Sound. The waterfalls are my favourite part of the whole cruise, getting up close and personal and being able to see how amazingly grand and powerful they are. As we pulled back into dock the butterflies in my stomach kicked in again. Sailing around the sound and taking in all that beauty I near forgot that I was about to take a 45-minute flight back to Queenstown. We had recruited two extra flying enthusiasts so this time round the back seat was taken. However, that meant that McKenzie let me ride up front with him… yep I played co-pilot for the way home. By co pilot I sat there with my hand firmly on my camera and not touching any buttons nor helping him in any way. I was just pumped to be riding shotgun on one of the most beautiful flights in the world. We took a different route home, flying around the Fiord, providing us with views straight back down to where we had just explored. More snow-covered mountains as far as the eye could see and the grand Mt Tutoko looking all smug in the vast landscape. We came back toward Glenorchy, mountains and river braids blanketing the landscape below. Lake Wakatipu looking as beautiful and blue as ever and welcoming us back home. I decided not to shoot as much on the way back into Queenstown, letting my mind process what had just happened and enjoying the last of my first ever fixed wing flight. As we landed, I couldn’t stop grinning. I walked the whole way home with an extra spring in my step and the biggest smile from ear to ear. Still now, as I write this I can’t believe how lucky I am to have experienced that amount of goodness in a half day flight to Milford Sound. Thank you to the whole team at Glenorchy air for getting me there and back again and fulfilling one of my dreams. I’m not keen on flying but I would be tempted by this one. It was fabulous! You forget that your flying while looking at those views! 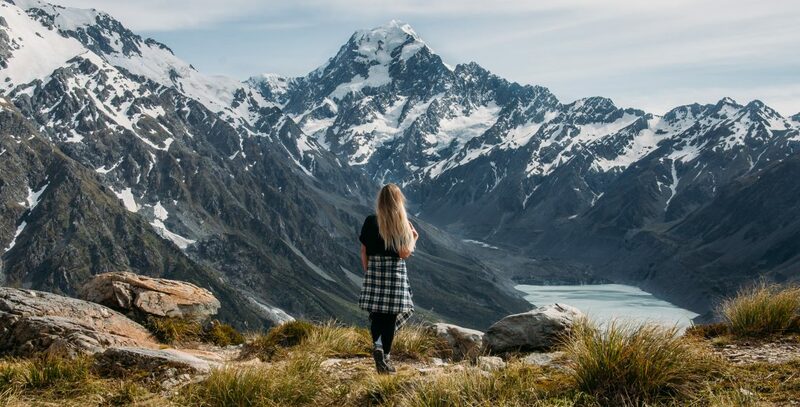 Oh Sophie what a beautiful write up and I’m kind of wishing I hadn’t read this because I have just returned to chch from Wanaka today and I really really really want to do this. Sounds so so amazing, I know I would be like a pig in a trough smiling nonstop from one side to the other on the plane and the boat. I take it that you flew out from Queenstown airport? And what is the international hand sign for dolphin please? great photos, it’s not easy from a plane I can imagine! with the helicopter we got to land at the beach and 5 mins later on the glacier which was surreal, I tell ya – coming from land-locked little austria.